Featured articles, publications, and all that jazz! Have you always wanted to start your own business? Think you're too old? You aren't. On this episode of What"s Next? with Diana Pierce, Urban Growler® Brewing Company owners Deb Loch and Jill Pavlak serve up their start up story. After 20+ years in corporate, these two combined their passions to create great beer, great food and space for everyone, becoming a first in the State of Minnesota for women owned brew businesses. Their story might #inspire you to follow your passion and create your own What’s Next chapter. Cali Common from Urban Growler Brewing: I love how so many of Urban Growler’s beers are food-friendly. Given that they are one of just a few breweries in town to have their own kitchen, it makes sense that they would have a decent number of beers that go great with what they’re serving. In particular, I found this crisp, clean, slightly herbaceous beer, brewed with lager yeast but fermented at warmer temperatures, to be the perfect foil for the brewery’s Friday night perch fish fry. If you haven’t been there to try the fish (or the beer) yet, I highly recommend making the trek soon. And get there early, because Fridays at Urban Growler are hopping. Fairly frequently, fellow food writer Nancy Ngo and I run across a dazzling dish while out and about, but we don’t always have a place for it in the newspaper. Today, we are changing that by starting a new feature called One Great Plate. When we find a dish we love so much we can write a whole story about it, we’ll bring it to you. This week’s dish really begins in 1992, when I arrived in Minneapolis to go to the University of Minnesota. I am from eastern Wisconsin, and naively assumed I’d be able to get a lot of the foods I had grown up with here. I was wrong on many counts, but the one food I’ve probably missed the most is the Wisconsin-style fish fry. Where I come from, no one eats battered cod or pollock on Fridays — it’s 100 percent lake perch, lightly breaded, quickly fried and as addictive as potato chips. I had pretty much resigned myself to an occasional indulgence when I happened to be in the motherland on a Friday night, but bless Urban Growler, because they have brought me that little taste of home. The brewery is serving perch, breaded and fried, just the way I grew up with it, every Friday (not just during Lent) for lunch and dinner. Co-owner Deb Loch is from Appleton, Wis., and her love for the perch fish fry runs deep. In fact, when she and Jill Pavlak were talking about opening a brewery, it was high on Loch’s wish list. Current chef Jim Weides, who worked for D’Amico for nearly 27 years, and recently took over the kitchen at the brewery, said he’s not been allowed to tinker with the fish fry. Weides said he sources the certified sustainable lake perch from a company in Ontario, Canada, and the brewery goes through quite a bit of it. “This is 100 percent lake perch, caught in cold northern waters,” he said, noting that they sold 122 fish fry dinners on the first Friday of Lent. The generous portion of perch is served with fries, crisp, house-made coleslaw, tartar sauce and, as is traditional in Wisconsin, a slice of pumpernickel bread. In my parents’ neck of the woods, it’s often rye, and it’s also served with a thick slab of sliced onion. Weird, but true. Weides said he’d consider adding a slice of onion for me. That’s the kind of service I’ll be back for — maybe every Friday. So long Fat Tuesday and hello season of sacrifice. The Friday night fish fry is a staple of the season when so many choose to skip meat on the last day of the work week. Wander through Wisconsin and a person can't throw a walleye without hitting a church basement fish fry during Lent. Around here, these restaurants are serving the goods that will leave your finger tips salty and a big smile stretched from ear to ear. Whether eating seafood for religious reasons or just love the smell of fresh fried seafood, there's a restaurant waiting with a fat, hot basket of battered fish. 5. Urban Growler Brewing Co. This brewery in Saint Paul batters up perch for its fish fry. The little crispies are served up with coleslaw, fries and pumpernickel rye bread. At Urban Growler, the staff enjoy two things during every shift: a beer and a bit of bacon. The team will be sharing these two loves with their customers this week (Wednesday is National Pig Day, after all) when they’ll create a flight that pairs five specialty beers with crisp, smoked, salted pork. The beer menu is yet to be fully released, but it will include a dark coffee stout, a sweet maple California common, a rum-barrel aged porter, and Cowbell Cream Ale, their versatile flagship brew. Pig out on other treats as well, such as bacon mac ’n’ cheese, BLTs, candied bacon, and a one-time bacon sampler plate. How a biomedical engineer and a business sales guru became the founders of Minnesota’s first women-owned microbrewery. Twin Cities residents Deb Loch and Jill Pavlak were on a bike ride one afternoon in the neighborhood of St. Anthony Park when they happened upon a rather old brick building, seemingly out of place among the industrial warehouses. The 19th-century structure, though it used to be a horse stable and maintenance depot, housed a pottery studio and a vacant unit. Pavlak and Loch, who were shopping around for a space for their new brewery, immediately knew: This was the place. Six years later, Urban Growler Brewing Company opened its doors to anyone and everyone looking for good food, good beer and a good time. Pavlak, a Minneapolis native, studied at the University of Minnesota-Twin Cities for speech communications and psychology — two unlikely, yet effective qualifications for the owner of a brewery. Pavlak spent most of her life working in sales, but she always dreamed of opening a restaurant. Loch, meanwhile, grew up working in her family restaurant in Appleton, Wisconsin. Working in the medical-device industry by day and crafting home brews by night, Loch discovered a passion for brewing. Winterfest 2019 really came off without a hitch this year. The beers were superb, the food pairings made a lot more sense, and the crowd looked better than ever. The Minnesota Craft Brewers Guild implemented after last year’s Winterfest and I think that they all made the festival a lot better. I love a chocolate dessert with a nice cup of coffee. This pairing made me so happy. I had no idea what a Bouchon was, so I had to do some digging in one of my baking cookbooks. Apparently, it is a cork-shaped chocolate cake. Bouchon, the French word for cork, gives the dessert its namesake. This rich cake, dusted lightly with powdered sugar, was the perfect bite. The rich and perfectly baked cake went perfectly with the beer. The Vanilla Latte Blonde Ale has a nice sweetness to it that is deceptively crisp, thanks to the blonde Ale base. The crispness of the beer along with its coffee notes from the malt really heightened the rich and luxurious nature of the Bouchon. I would love to have these for dessert again and I hope that Urban Growler will bake some of these again. I really enjoy writing this article, but these awards get harder and harder every year! That’s mostly because there are so many great breweries in the state and partly due to some self imposed limits. Every award must go to a brewery I’ve visited in the calendar year and I won’t give a brewery the same award two years in a row. I also added a Best Innovation category to reward the breweries that are consistently pushing the envelope! 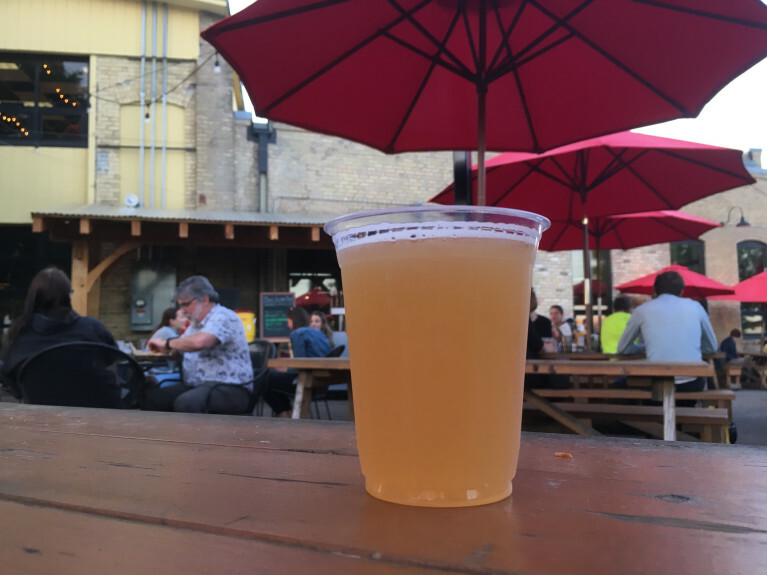 I’ve visited almost 100 breweries in Minnesota and written posts about a healthy amount of them. If I’m missing your favorites I’d love to hear about them. Let’s get to it! Urban Growler holds a special place in my heart as one of the first craft breweries my wife and I visited and their food and beer played a critical role in inspiring me to embark on this project. They were the first brewery to make me think that I was missing out on something special. Since they’ve opened, their menu has expanded and I’ve never been disappointed. It doesn’t hurt that their building is beautiful, the patio is great, and they make desserts with their beer! Personally, 2018 was the worst year ever for me. At my day job, where I teach Language Arts at a middle school, 3 students passed away in the span of 3 weeks-2 because of suicide. Right after that, my mother passed away unexpectedly. For the next few months, I struggled mightily emotionally and fell into a bit of a depression. So, typically, when I look at a year in review, I can pinpoint moments and breweries that strung the year along as I live life passionately as a beer geek. 2018 was not one of those years. Amidst the sadness and depression of losing irreplaceable people, I relied on friends and family. I also relied on craft beer. Ok, I know what you are thinking. How can it get darker than the first paragraph? Well, let me explain what I mean by relying on craft beer. I did not decide to one day clear out my cellar and go on a bender-I know better. However, I did embrace what craft beer has become for me. Over the years, craft beer has always been a way to decompress and enjoy time with friends or total strangers. My favorite taprooms became beacons of refuge-places to go and just be. I would doodle, read, and sip. When I was lucky enough to see a familiar face, they would join me and friendship would provide a respite from the pain of losing my mom. So, it is bittersweet and somewhat difficult to look back at 2018. Yet, 2018, among its challenges, offered up some wonderful experiences with friends. Craft beer continues to provide me with joy and knowledge. Taprooms continue to be the backdrop for connecting with people and augmenting the thread count of my community fabric. When I say best of 2018, there are several things that factor in to that. First, if I didn’t go to this brewery in 2018, it didn’t make the list. Second, breweries on this list had many quality beers that I thought really hit the mark. This list is not about who has the trendiest beer, although there are a few breweries on here who are leading the way when it comes to IPAs, sours, and pastry stouts. If a brewery makes my list, it means that their service is great, their message is easily articulated, and they are not just in it to make a quick buck. Luckily, places who adopt the latter as a business model don’t last long. Love it or hate it, this is my list and a snapshot of my beer experiences throughout the year in Minnesota. My favorites are not going to be your favorites and that is ok. It is fine to disagree. I would even like to hear where you think I misstep in my rankings. I ask that you would do so with civility, but hey, this is also the Internet, so that is a big ask. So, here we go, my top 30 breweries of 2018 in MN. Over the years, Urban Growler has always been on my list of places to go for fun. I love the vibe here. Jill and Deb have created a wonderful community and it shows in their staff and space. I also love that they continue to bring new innovative beers to the table. Recently, they added a mild and a Mexican Lager to the fold and they are both tremendous. This year’s barrel-aged porter was phenomenal. Their food is tasty and if you haven’t tried the fried chicken sandwich, drop everything and go there now to do so! It's a fun month for craft beer. Urban Growler brewed beer using the Guatemalan ramón nut. In collaboration with a University of Minnesota sustainable forestry researcher, Urban Growler is using an altogether unusual ingredient in a limited-edition beer. David Wilsey, a researcher at the Humphrey School of Public Affairs, was investigating how the ancient Mayan food source can be a tool of economic empowerment for people living where it grows, when he got the idea to brew the nut into beer. Working with a group of his students, Wilsey secured a grant and approached Urban Growler’s owners. Their first batch last spring sold out rapidly. It’s back on tap till it runs out. The craft beer boom is starting to include people of color and women. There was a dusting of snow on the turf, but that didn’t stop a small group of soccer players from kicking a ball around outside a brewery in Minneapolis’ Harrison neighborhood. Inside, on a recent, frigid Friday, two men were introduced by a third. “Mucho gusto,” the new acquaintances said to one another — Spanish for “nice to meet you” — as they sipped on pints of golden cerveza. The soccer field in the parking lot of La Doña Cervecería (241 Fremont Av. N., Mpls., 612-315-4613) is just one bit of South American flair that owner Sergio Manancero wove into the Twin Cities’ first Latin-inspired brewery. Another: the sprinkling of Spanish language throughout the colorful warehouse-turned-taproom, from the conversation to the names of the beers. Across the metro, in St. Paul’s W. 7th neighborhood, a group of four craft beer aficionados turned a hobby into a job when they became the nation’s first Hmong owners of a brewery. They took over Vine Park Brewing (1254 W. 7th St., St. Paul, 651-228-1355) last year, and they can barely keep up with the demand for their 651 Tyga Bite, the first beer they brewed specifically for their community. Although craft beer — both brewing and drinking — is statistically a largely white, wealthy, male pastime, a boom in new breweries has led the industry to finally begin to diversify. There are now more than 150 craft breweries in Minnesota (up from 35 in 2011). Only a handful of them are led by people of color and women. But industry watchers say an explosion of interest in small-batch, high-quality beer made by local brewers is opening doors for nontraditional consumers and makers to grab a seat at the bar. “It is changing,” said Bart Watson, chief economist of the Brewers Association, a trade group for small and independent craft brewers, which has recently launched a diversity committee to help breweries appeal to a wider variety of customers and staff. That means that more and more, communities long untapped by the craft scene are now finding places to cultivate their tastes for beer comfortably. “When you’re not included, you feel it,” said Jill Pavlak, co-owner of the first woman-owned brewery in Minnesota. When she and her wife, Deb Loch, opened Urban Growler Brewing Co. (2325 Endicott St., St. Paul, 651-340-5793) four years ago, one of their first initiatives was to keep the taproom warm enough so guests wouldn’t have to wear a coat. They also made sure chairs had knobs for purse straps, and that the parking lot was well lit. “Things women think about that men wouldn’t give a second thought,” Pavlak said. Gallery: The Doña Fria Lager at La Doña Cervecería in the Harrison neighborhood of north Minneapolis. Deb Loch and Jill Pavlak of Urban Growler Brewing Co. in St. Paul. Pavlak and Loch were denied by 12 banks before they could get a loan to open their brewery. But in just a few short years, the indignities they faced are finally dissipating. Most of the recent gains in equality in the craft beer world have been along gender lines. The distribution between men and women craft drinkers is beginning to even out, according to demographic data. As far as leadership, researchers at Stanford University found that as of 2014, 21 percent of breweries in the U.S. had at least one woman as founder/CEO or brewmaster/head brewer. No studies have been done since, but Watson from the Brewers Association believes it to be about the same today. Ethnic diversity is a different story. Of new craft drinkers over a three-year period, 81 percent of them were white. In just a year, Touyer Moua has seen how eager his Hmong community has been to discover craft beer. A home-brewer himself, he and three family members stumbled upon Vine Park Brewing last year. The 23-year-old brewery allows visitors to brew their own beer and wine on the premises, and after making their first batch, they were convinced they would buy the place. Six months later, they did. Right away, they brewed a beer specifically aimed at Hmong drinkers, who, Moua said, tend to veer toward light beers like Bud and Heineken. The twist: They threw rice in along with the barley. “Rice is our bread and butter back in our country,” said Moua, who immigrated to the U.S. from Laos as a refugee at age 2. Their beer, 651 Tyga Bite, is named for a particular fear his parents and other migrants had while crossing the jungle and the Mekong River to get to Thailand, and eventually the U.S.
“We made it through the jungle, we made it to the U.S., and we didn’t get bitten by a tiger,” Moua said. Fashion Runway Show in St Paul, MN, benefitting Dress for Success Twin Cities. Organized & sponsored by Urban Growler Brewing, Elite Repeat, Well-Layered, and Nancy Dilts Wardrobe Consulting. Minnesotans love a good beer. How can we prove this thesis? The state bird is a saison. Every lake has an official beer. The livestock feeds its young milk stouts. OK, fine. While none of that is true, per se, quality breweries are spreading through the state like milkweed in the fall. It can be hard to keep tabs on all the beers you should take for a spin. Here’s a solution: Drink these beers. The ones made by the breweries below. These are good beers. There are fine beers outside this list, of course, everywhere from Marshall’s Brau Brothers to Voyageur Brewing, so far north you’re basically in Canada. Not to mention breweries that don’t bottle, such as the Minneapolis-based Dangerous Man, which weren’t considered here. Instead, the beers and breweries listed here are ones that should be available at your local liquor store or via booze delivery services like Drizly or Saucy. They're all high-ABV, proven to go well with an outdoor sheet of ice, heartbreaking pro-sports losses (ubiquitous, with the exception of the Lynx), and a nice plate of tater tot hotdish. Enjoy. This one almost drinks like a dessert beer, though it’s definitely not that heavy. It has a rich vanilla taste that evokes actual beans with a light coffee taste. They were going to can this one but wound up not going for it this year. You’ll have to swing by the taproom to get your hands on it. Plum Grissette from Urban Growler: Have you tried a grissette? It’s sort of like a saison, but less sweet and more refreshing. The beers were originally brewed for miners in Belgium, to help them quench their thirst and cut through the grit of working a long day underground. This version uses plums from Swenson Orchards in Montevideo, Minn., to add some tartness and local flavor to the brew. A little tangy, a little spicy and a lot drinkable, this beer-history lesson is worth seeking out. The beer that resulted from the partnership is still available on tap. After nearly 20 years of researching the Ramón nut, Dave Wilsey and Dean Current had an idea: use the protein-rich Central American seed to brew beer. He contacted Urban Growler Brewing Co. in St. Paul to set up a partnership last year. Now with a grant from the University of Minnesota’s Institute on the Environment’s mini-grant program, the brewers and conservationists hope the brand-new brew will raise awareness about rainforest conservation efforts. Two beers that resulted from the collaboration became available for customers in mid-March, and one sold out in a matter of days. The second, a stout with “notes of chocolate, coffee and nuts,” is still available on tap. The Ramón nut is native to Central America, South America and the Caribbean, and has become symbolic of the conservation and development work happening in the Maya Forest, said Wilsey, director of the University's Master of Development Practice program within the Humphrey School of Public Affairs. The region is facing deforestation, as large portions of the rainforest are cut down and destroyed to make way for cattle grazing land, Wilsey said. He hopes that encouraging widespread sale of the nut — which only grows in the rainforest — will preserve the rainforest. Wilsey and his colleague Current have been working with the Ramón nut since the early 2000s. During that time, the University has sent three teams to Guatemala with the Rainforest Alliance to study the nut. Wilsey hopes to organize a brewer exchange in the future and bring Urban Growler workers to Guatemala to teach people there how to brew the beer. “This partnership will help people learn about opportunities that might exist in forest conservation and livelihood development,” Wilsey said. The Ramón nut is rich in nutrients like protein and fiber, said Collin Motschke, a graduate student whose master's thesis is on the Ramón nut. He said he hopes the Ramón nut will become “the quinoa of the future” and a widely-used ingredient around the world. Wilsey’s ultimate goal is to have a major business use Ramón nut as an ingredient in a food product, creating marketing opportunities that will increase the rainforest’s value and protect its resources. “There is so much power in being a consumer, and the consumptive decisions that we make have an impact and have ripples throughout the entire world. This is a way that people can be intelligent, compassionate and sustainable consumers,” Motschke said of the partnership. Pavlak said she explains the partnership to everyone who orders the beer to spread the message. “The beer is already good, but the story behind it makes people feel even better about ordering it,” she said. The Ramón nut could start an international conversation about conservation through this beer, Wilsey said. “We have this belief that we all want the same things from life, to be loved and accepted, and that goes beyond our community. It’s a worldwide desire and right. To be able to make some sort of impact in another country is really quite amazing,” Pavlak said. ot every beer has the lofty goal of saving the rainforest, but that’s precisely what the University of Minnesota and St. Paul’s Urban Growler Brewing Company aimed to do with two recent beer releases. Their collaboration centers around the rámon nut, a seed that grows in tropical forests in Central America, South America, and the Caribbean. In an interview with the Minnesota Daily, David Wilsey, director of the Masters in Development Practice (MDP) program at the U’s Humphrey School of Public Affairs, explains that since the ramón nut can only be grown in the rainforest, encouraging its widespread sale would help in preserving these rapidly disappearing forests in its native lands. And after nearly two decades spent researching the ramón nut, Wilsey had a (thirst-driven?) revelation—the protein-rich, Central American nut would be perfect for brewing beer. Last year, he reached out to Deb Loch and Jill Pavlak, the co-owners of Urban Growler, who immediately took to the idea. This March, two beers from the environmentally-minded collaboration were released in the taproom. The Ramón Nut Brew, a brown ale, almost immediately sold out. The Ramón Nut Stout Collaboration #2, a chocolatey, nutty stout with notes of coffee, is still available on tap. Read the Daily’s full story here. On Aug. 5, the Minnesota Lynx continued their Inspiring Women Platform by honoring Jill Pavlak and Deb Loch. 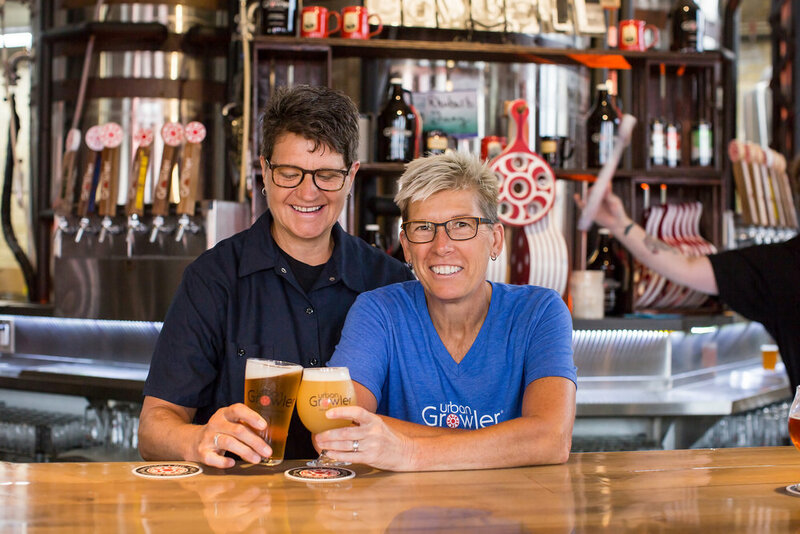 Pavlak and Loch are co-owners of the first women-owned brewery in the state of Minnesota, the Urban Growler. In 2017, the two were awarded the Alice O’Brien Award from St. Paul in recognition of a women-owned business that is committed to equity and empowerment. They are also the sixth-largest LGBTQ business in the state of Minnesota. Their goal is to be one of the top-10 breweries in the state by reputation, not volume. The two were honored with a team-signed basketball by Lynx Vice President of Business Operations Carley Knox. What happens when two women decide to leave their corporate jobs to pursue their passion in brewing? Urban Growler owners Jill Pavlak and Deb Loch had the idea in 2008 to start their own brewery. This was arguably the best time to launch their idea, since they were just ahead of the local micro-brewery boom and men were getting their businesses up and running left and right. Together, these two women had the perfect combination of experience; Deb had worked at Summit Brewing Company, has a Master’s in brewing, and started her own at-home brews—while Jill had the sales background and wrote their 160-page business plan. The women had to go through nearly a dozen banks in order to open their brewery. Many bankers, even women, told them “we’re just not comfortable” with women running a brewery. Their age and gender were questioned constantly—“Are you sure you can lift the bags of hops?” The sexism and ageism they faced was unexpected, but their perseverance and grit are what got them over the hurdles and through the next six years. They were the national runner up for a Palo Alto Software business plan, won beer competitions and $10,000 in free legal service. Despite the recognitions, it seemed the accomplishments still weren’t enough. “The good thing about all of this was we had to get creative,” she said. When one bank told them that if they raised $500,000 on their own, the bank would front the rest, they went through with drafting architectural designs, sold Urban Growler shirts, called friends and family, and had people donate money to be named founding members (they couldn’t legally say they were looking for investors). After finally raising half a million dollars, with over 50 founding members, the bank told them it still wasn’t enough and they would only let them open at a much higher interest rate. It wasn’t until one of the owners at Burning Brothers Brewing spoke to their bank on behalf of Jill and Deb that all this hard work finally paid off. A stark contrast from the other banks they’d met with, this bank outside of the Twin Cities was swift in their investment. The two were ecstatic, Jill recalled, “They weren’t even from around here! They’re down in Mankato and they were all on board. It was just like, ‘here’s your money’ within two weeks. Then multiple banks came back around wanting to invest.” It wasn’t until they got their business license that they received a letter congratulating them on being the first woman-owned microbrewery—and that was in 2014. “Every decision we make is with women at the top of mind.” Jill says she and Deb make a point to be accommodating in ways other breweries and businesses may not think about. From the lower ABV beers and temperature of the taproom being geared toward women, to chairs that allow purses to be hung on them, they constantly use their own perspectives to be more inclusive. To hear their story firsthand and see the newly-expanded space, contact Liz at liz@urbangrowlerbrewing.com to schedule a tour. You can find co-head Jill in the taproom, and Master Brewer Deb working behind the scenes, at 2325 Endicott Street, St. Paul, MN. “It’s all about the community and how we bring people together through beer,” said co-founder and Master Brewer Deb Loch. Celebrating their fourth anniversary in business, Deb and co-founder Jill Pavlak have been slowly building their brewery through quality products and local participation. Urban Growler (www.urbangrowlerbrewing.com) was opened in July 2014 when Deb and Jill combined their talents and passion to create outstanding beer, food and a welcoming space for the community. As Minnesota’s first female-owned brewery, they had many challenges getting their vision in place. But with the help of friends, family and even total strangers, Urban Growler became a reality. Their patrons believed in the founders vision and their support helped get one of the hottest new breweries off the ground. Now that spirit is being repaid with a company that is there for the community. 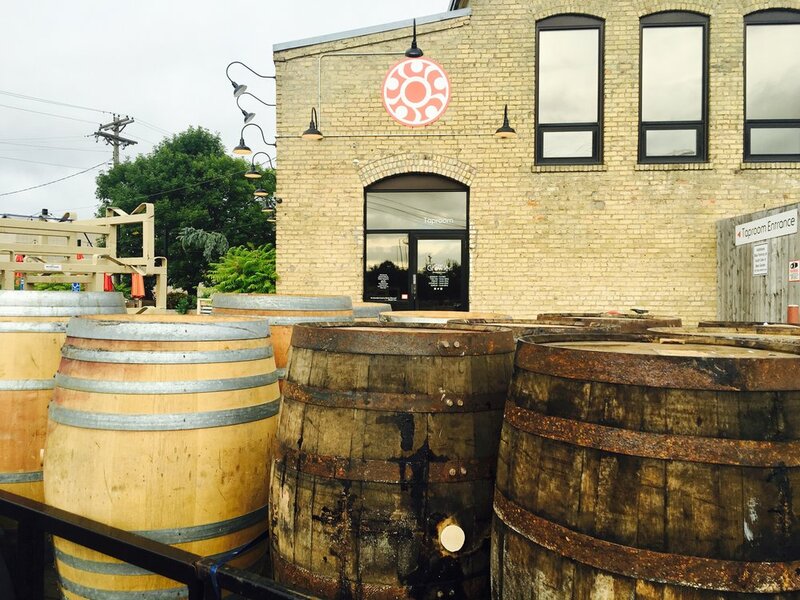 The brewery, located at 2325 Endicott St. in St. Paul, Minnesota, features a warm, welcoming taproom, on-location kitchen and an outdoor beer garden. There are also indoor retail spaces that can be rented for hosting meetings, weddings, and local social gatherings. But one of the most interesting things about Urban Growler is the building itself. This century-old brick and timber space was once home to the St. Paul Police horse stables back in the late 1800’s. After that tenure, it became a manufacturing facility for wooden skis and hockey sticks (after all, this IS Minnesota) as well as other warehousing in later years. The designers for Urban Growler did an awesome job of resurrecting the true character of the old building while adding a few modern updates for comfort and accessibility. The brewery is looking to output 2000 barrels this year, up from about 1250 last year. Their flagship brewsinclude traditional beers like their CowBell Cream Ale, Midwest IPA and their De-Lovely Porter. They also brew an interesting Kentucky Uncommon Ale and a “West-Coast-hops-meets-East-Coast-maltiness” Golden Hammer IPA. All Urban Growler flagship beers are lovingly handcrafted in 10-barrel batches under the close supervision of Master Brewer Deb. But one of the best things about being a small brewery is that you can brew small batches and experiment with limited releases. Last year, Urban Growler brewed over 40 different beers, some as small as half-barrel experiments! Most of these end up in the taproom where their popularity is voted on by their customers’ consumption. The more popular winners then might end up as a seasonal or limited release for distribution in cans. Lately much of their focus has been on a concept that they call “Plow to Pint®”. They have found that people would rather drink locally and that they appreciate locally sourced products. For this endeavor, Urban Growler uses ingredients harvested from farmers in the area to create unique beers with a distinct twist. Some of the recent favorites include Blueberry Wheat featuring blueberries harvested from a family-owned farm in Princeton, MN, and an Oak Aged Imperial Ale with Frontenac Grapes that used classic oak barrels and Frontenac grapes gown outside Red Wing, MN. They are currently working with the Rainforest Alliance in Guatemala and the University of Minnesota to create a collaboration brew using the sustainable ramon nut. Not your ordinary Stout. While most of the flagship beers at Urban Growler are filled by a Wild Goose system into preprinted cans bought in bulk, these new small batch creations are getting canned and labeled using pressure-sensitive custom-designed labels. This allows the brewery to be more flexibile while doing a small batch economically and using eye-catching designs for their new brews. Urban Growler has been canning approximately 150 cases of their small batch seasonals every few months. But because of their success, they are now looking to ramp things up to 250-case batches of their special beers once a month. To do this, the brewery had to invest in a new automated labeling system. After much research and a few false starts, they happened to find Weber Packaging Solutions online. They contacted Weber whose local rep came out to see what the best solution would be for Urban Growler. The brewery was growing and would need to be able to scale up to the larger brew runs at higher speeds in the future. Reliability was key to a new system and it had to be easy for the staff to operate. Steve Sylvander, the local Weber rep, suggested a PackLeader 501 wrap-around labeling system that would fit right into their existing canning line. And since Weber is one of the largest label manufacturers in the USA, Steve helped Urban Growler get their custom labels printed for the first few runs. Their first two brews off the new line were a Rhubarb Wit (yum!) and their Kentucky Uncommon. Head brewer, Jesse Pittman, who came to Urban from Swamphead Brewing in Florida, was there for the installation and managed the first runs. Urban Growler is now in the position to can and share more of their specialty beers with an ever-widening audience. Being self-distributed, the brewery only reaches the metro St. Paul/Minneapolis and surrounding areas for now. But plans are to continue to spread their brand and grow at a comfortable pace. I have a feeling they will do it.